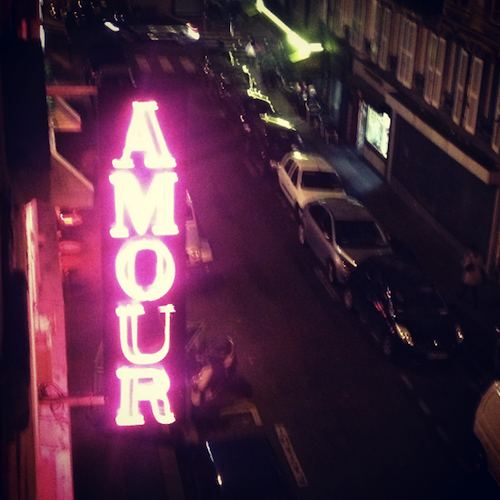 I write to you from the Hotel Amour in Paris, which is the oddest little place. (The hotel, not Paris.) I am drafting a review on this hotel, simply because you must see a picture of the disgusting object that they have on the reception desk and also the wallpaper that covers my walls and ceiling. It’s just…bizarre. I’m in Paris doing a “super secret shooting”. No, I haven’t been hired as a hit man (or woman), I’m just doing a little shoot that I’m not allowed to talk about. It happens. I rushed in on the Eurostar yesterday and now, perhaps even as you read this, I’m on my way back to London. The wonders of modern transport. How lovely, you may think, but rarely do I see much of Paris on such a flying visit – it’s usually Eurostar-to-Hotel-to-Studio-to-Hotel-to-Eurostar. Not that I’m complaining – it’s nice to have a clean room to sleep in and no boxes to unpack! I now have three minutes until I have to be at dinner and so I must dash – toodle-pip, a demain! I leave you with the breaking news that (after a whole long summer of abstinence) I have cracked out the Liquid Gold again to get my skin sloughed, buffed and back to perfection. Wonderful stuff. I used it on Thursday night, pre-shoot, and my skin was looking pretty bloody good yesterday morning. If you haven’t the foggiest what I’m on about then read this or this.